As 2012’s drought devastated last year’s crop yields, findings from the latest USDA Crop Production report shows expectations of 2013 being a record-breaking year for corn yields. The report projects a national corn crop of 13.8 billion bushels in 2013, a drastic 28% increase compared to last year’s 10.7 billion bushels. 2013’s 13.8 billion bushels would beat out the previous record of 13.09 billion bushels set back in 2009. Jay Akridge, Glenn W. Sample Dean of Purdue Agriculture, said in a recent Purdue University news release, "To say what a difference a year makes is a huge understatement. It's a big difference this year." According to the USDA findings, corn planting conditions were unfavorable for growers this year, slowed by cold and wet conditions, as only 5% of corn had been in the ground by the end of April. However, during the week ending on May 19, growers set a single-week planting record, getting 43% of the crop in the ground. Since then, favorable conditions, especially in August, have led to much improved corn conditions compared to 2012. Purdue Extension agronomists Bob Nielsen, says in the Purdue release, "Half of Indiana's corn crop was planted after the 15th of May, which is the third latest in the last 10 years. But we've learned that the planting date is not always a direct predictor of yield." 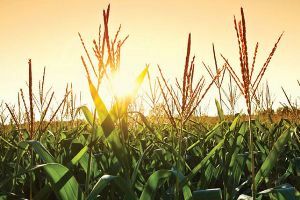 2012’s drought had devastating effects on the nation’s corn crop, however, thanks to recent favorable growing conditions, 2013 is expected to return a record-breaking yield according to the USDA.